Andrew D. Fisher was stationed at Fort Benning, GA at the time this article was published, serving as a Physician Assistant in the U.S. Army. He has no financial interest in any products mentioned, nor has any conflict of interested to disclose. These opinions are his own and are not endorsed by the U.S. Army or the Department of Defense. This article first appeared in Havok Journal on 17JAN15. With so much talk about the flu this year and “Should I get a flu shot or not?”, I thought the issue needed a bit of explanation. First, before anything else, influenza is a respiratory illness. It does not affect the gastrointestinal tract; there is no such thing as the “stomach flu.” Now that we have covered one of the biggest pet peeves of providers, we can get down to business. The influenza virus has been around at least 2,000 years with possible historical evidence of pandemics back to the late 1500s. It is an RNA Virus, which infects the respiratory tract to include the nose, throat and bronchi. Dependent on the type of influenza virus, it could also infect the lower airways causing pneumonia. There are two types of influenza that are relevant in human disease, and each type has its own strains. Type A Influenza can infect not only humans but also a variety of animals as well. Type A Influenza is responsible for most of the pandemics throughout history, like the 1918 Flu. These pandemics usually start when a single cell within a human or animal gets infected with an animal influenza strain, and a human influenza strain. Both viruses then mutate to form a new virus that is very different from anything that any human has ever been exposed to. For example, not too long ago there was the Avian flu scare when a bird flu virus mixed with a human flu virus. Viruses like influenza typically do not infect humans, but they can, and once they do, it is then easier to spread from human to human. Type B influenza only infects humans and does not cause pandemics. Both Type A and B influenza viruses have two glycoproteins that are an integral part of their structure: haemagglutinin (HA) and neuraminidase (NA). We build our immunity to influenza by making antibodies to these proteins. Both of these proteins have multiple different subtypes and are numbered accordingly: H1, H2, H3, etc., and N1, N2, N3, etc. 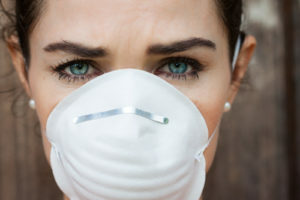 You’ve likely heard this classification before if you’ve ever heard of the H1N1 “swine flu,” a strain born from mixing a human flu virus and a pig flu virus. Since the development of the first vaccine by Edward Jenner in 1796, vaccines have saved millions of lives. Interestingly, the word vaccine is derived from Variolae vaccinae, a virus that causes Cow Pox. Jenner discovered that people exposed to Cow Pox were immune to Smallpox and subsequently used Variolae vaccinae to develop a small pox vaccine. The influenza vaccine was first produced in 1931 at Vanderbilt University and by the 1940s, thanks to the military, an inactivated vaccine was available. The process that produces the vaccine sounds simple enough, but it is incredibly difficult and takes some good guesswork. The World Health Organization (WHO) has five labs around the world. Each lab collects samples. The WHO then takes these samples from their five different labs and evaluates all the different stains. Using past data along with the data collected from the different labs, they analyze and make a prediction about which strain will have the biggest impact around the world. This is all done months prior to the actual flu season. They typically use two type A viruses and one type B virus, thus it’s called a trivalent vaccine. This is a tricky process because influenza mutates very rapidly and continuously makes changes to its structure. This phenomenon is known as antigenic drift and is why new flu vaccines are necessary every year. Occasionally the WHO will select old types to make the vaccine in part because a certain strain that’s been seen before may reemerge. This could cause a problem if a large portion of the population wasn’t yet born when that strain last presented itself. Once the decision is made which ones to include, the WHO sends these results to different labs around the world to produce the vaccine. Labs use chicken eggs to make the vaccine. It takes roughly 900 million eggs to create about 300 million vaccines for an influenza season. There are some concerns about using eggs. If the avian flu affects chickens too, there may not be as many eggs available to create the vaccine. When enough of the virus has accumulated, it is taken out of the egg and made into the vaccine. Due to crowding and more stagnant lifestyles, influenza and other illnesses become more prevalent in the winter months. The signs and symptoms are fairly straightforward. Sudden onset of fever, cough, body aches, and runny nose. This differs from a cold because colds do not usually cause a fever. As mentioned before, there is no such thing as the stomach flu, but that does not necessarily mean you cannot have mild gastrointestinal symptoms, however, they are uncommon. This year there has been an increase in influenza-like illness, characterized by a fever, with a cough or sore throat, but no identifiable cause. So what went wrong this year? Why are so many people getting the flu even when they got the flu shot? As mentioned above, antigenic drift happens all the time with viruses. This is why it is a guessing game each year.